Punditeer: How Dangerous Are Our Leaders? How Dangerous Are Our Leaders? 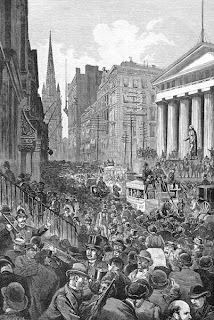 The economy is on its sickbed and the market continues to submerge to the bottom of the financial sea, eliminating the traditional act of self-defenestration as an inadequate and ultimately pointless reactionary response. It's not a window we need but a mirror. Yet Congress, with the country in flames all around them, spend hundreds of billions on non-stimulus projects that are remarkable for their lack of relevance to the state of the economy. And President Obama, not to be outdone or upstaged, addresses the nation on TV with the firm intention not of calming the markets and reassuring the people, but of declaring war on capitalism and excoriating his personal enemies--Wall Street executives and businessmen in general--with an angry tirade promising wealth redistribution that will bring them all to their knees. The stock market has reacted predictably, with Obama oblivious to the damage to all. Mirroring Lincoln, Obama steers the nation toward a new kind of civil war. Is the public unable to elect responsible leaders? I would sooner be governed by a random selection of 435 people on MySpace instead of the current members of the House of Representatives. I would rather be governed by 100 random members of Facebook than the current members of the Senate. And I would would accept one member of LinkedIn selected at random as President of the United States instead of Barack Obama. Those individuals, I am confident, would do less damage to our country than those who hold power in Washington. But what do we do about the voters? Leave them alone to elect any charlatan with a talent for conning them? Elections to high public office are nothing more than exercises in who can snow the voters better than his opponent. Do we raise the voting age to 30? Or lower it to 5? Would that help? Maybe it's time to try?